In this DVD, El shares his insights on music and guitar playing, along with his evocative and distinctive guitar style. 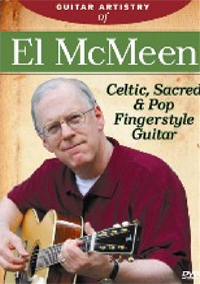 His music ranges from Celtic songs and dance tunes, through alternating-bass Americana, sacred music, pop tunes and his original compositions. PDF files of the tab/music of those tunes marked with an astric (*) are included on the DVD.